This is a code golf challenge. Just like the title says, write a program to covert a string of ascii characters into binary. "Hello World!" should turn into 1001000 1100101 1101100 1101100 1101111 100000 1010111 1101111 1110010 1101100 1100100 100001. Note: I am particularly interested in a pyth implementation. Like KSFT's answer, but I thought I'd point out that, in addition to raw_input -> input, Python 3 also has an advantage here due to the splat for print. j           # join(                               "Join by space"
d          #      d,                             "this space"
m          #      Pmap(lambda d:                 "Map characters of input string"
j         #                    join(            "Join by empty string"
k        #                        k,           "this empty string"
j       #                        join(        "This is not a join, but a base conversion"
C      #                             Pchr(   "Convert the character to ASCII"
d     #                                  d  "this character"
2      #                             2       "Convert to base 2"
z         #           z)))                      "mapping over the input string"
Input is the string that needs to be converted without the quotes. I'll work on translating this into Pyth. Someone else did a Pyth answer already. Takes input via STDIN. 6 bytes saved thanks for AShelly and another 4 thanks to britishtea. Alternatively, if x is defined as the string Hello World! in the workspace, then just dec2bin(char(x)) will work. Normally, one should use foreach and not map. 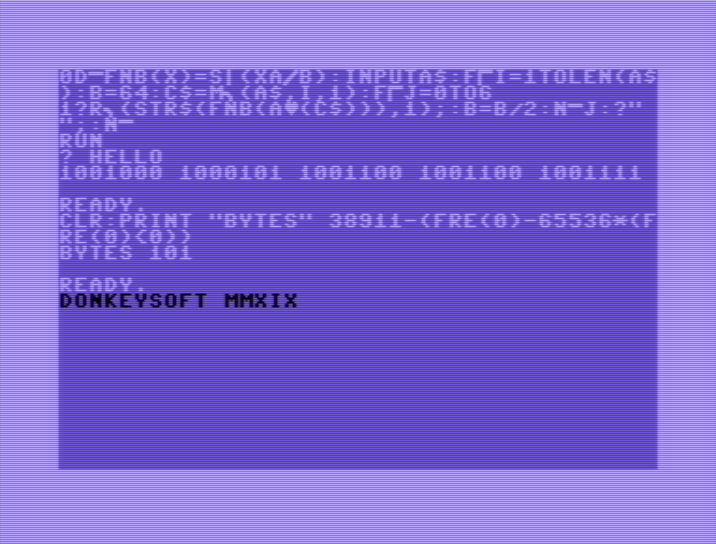 Complete PC DOS executable COM file, input is via command line. *Since it wasn't explicitly clear to me whether or not leading zeros are allowed, am posting versions both ways. heavy use of the list monad. it couldn't be converted to list comprehentions because the last statements weren't a return. Thanks to Adám for help with this solution. The function fn b declared on line zero accepts a numeric parameter of x which is ANDed with the value of b; SGN is then used to convert x and b to 1 or 0. Line one accept a string input to the variable a$, and the loop starts (denoted with i) to the length of that input. b represents each bit from the 6th to 0th bit. c$ takes each character of the string at position i.
line 5 starts the loop to test each bit position; right$ is used in line 6 to remove a auto-formatting issue when Commodore BASIC displays a number, converting the output of fn b to a string; asc(c$) converts the current character to its ascii code as a decimal value. Line 7 represents the next bit value. The loop j is ended before printing a space, then the last loop i is ended. I was hoping to beat Martin Ender, but I only managed to tie him. Takes input on STDIN; +1 bytes for -p flag. Input string is at memory address #0000H (allowed). Output in binary via front panel I/O lights D7-D0. Example, do RESET, then EXAMINE to see the first byte, followed by repeating EXAMINE NEXT to see the rest. I used a different approach than most. Read in via the display _request() prompt (shortened to di _r(r)). Write the string to a file called b in text mode. Open b in binary mode and read each character as a byte and convert to binary. Technically the b file should be closed at the end, but it is a valid program and runs successfully without it. I'm new to Go and I'm not sure on the rules for counting characters in this language on here either. You can run it here. Not the answer you're looking for? Browse other questions tagged code-golf string binary conversion or ask your own question.